A trading strategy includes several weighted and prioritized index stocks. We select the weights and prioritizes the index stocks based on yield and risk indicators, which are determined using historical price time series and current market data. During the life cycle of a trading strategy, we can make adjustments in order to always offer the best possible risk-return ratio to our customers. We generate the trading signals automatically according to a specific procedure, taking into account weighting and prioritization. For a single stock and within a certain trading strategy, we do not distribute a buy and sell signal at the same day. The trading strategies follow a portfolio approach. The recommended share of the total investment amount, which is included in the buy signal, allows our customers to manage a pre-defined investment amount. Our trading signals base on calculations of the FINVAX algorithm, which uses real-time stock exchange prices. After market data import, the market data-based algorithmic signal generation takes place without any manual intervention. For the algorithmic generation of a buy signal, the real-time ask price received from the stock exchange is compared with a former ask price. Indicators derived from stock exchange market data as well as date and time can also be included in the calculation. 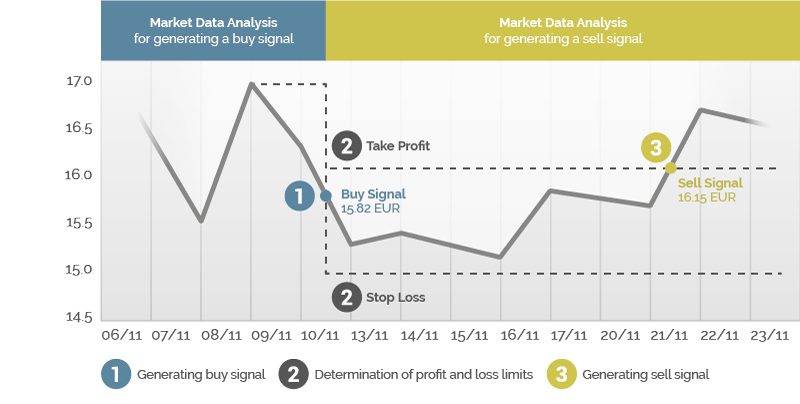 For the algorithmic generation of a sell signal, the real-time bid price received from the stock exchange is compared with the purchase price. Indicators derived from stock exchange market data as well as date and time can also be included in the calculation. Buy and sell signals relating to a single index stock alternate as part of a trading strategy. A buy signal is always followed by a sell signal. There is always at least one trading day between the trading signals in respect of a single index stock as part of a trading strategy, i.e. no two trading signals for the same stock will ever be transmitted as part of the same trading strategy on the same trading day. However, as part of different trading strategies, multiple concurrent or reverse trade signals may be generated and transmitted in respect of the same stock on the same trading day.